This Sweet Potato Chili Pasta is a one pot dish that’s packed with the warm and comforting flavors of the season. 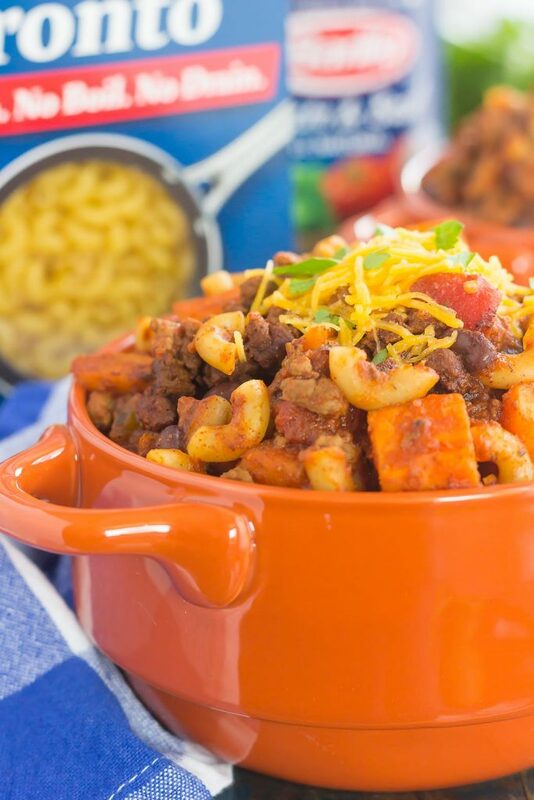 Hearty, thick, and filled with sweet potatoes, beef, black beans, and pasta, you’ll love this easy meal! The weather is getting colder, the days are getting longer, and the holidays are just about here. I will admit that I’ve been listening to Christmas music during the day while in the kitchen, or in my office doing blog work. It just puts me in a feel-good mood for the day, no matter what seems to be going on. In my area, there is a radio station that plays Christmas music 24/7, starting around mid-November and going through the end of Christmas. It’s the first station that I tune into when I get into my car, and I love the cheerful songs that come on. However, I’ve noticed that they play the same 30 or so songs over and over and OVER, even though there’s about eleventy billion Christmas songs out there! This frustrates me every year (along with ABC Family’s (now Freeform’s) choice of Christmas movies on TV that are all of about 10 movies on repeat, yet I still watch…). Oh well, maybe next year they’ll get the hint! Now that I’m in holiday mode, I’m thinking of some easy, yet seasonal dishes that I can make for dinner. Whether it be for the hubster and I, or for entertaining some holiday guests, I’ve got dinner on the brain. And what’s better on a cold night than a big ‘ole bowl of chili! Am I right? Chili just screams comfort food to me and is perfect to enjoy on a crisp night. 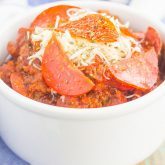 And since you all loved my Slow Cooker Hearty No-Bean Chili (it’s one of the top five most popular recipes on Pumpkin ‘N Spice), I thought I would put a new twist on a comfort food classic. 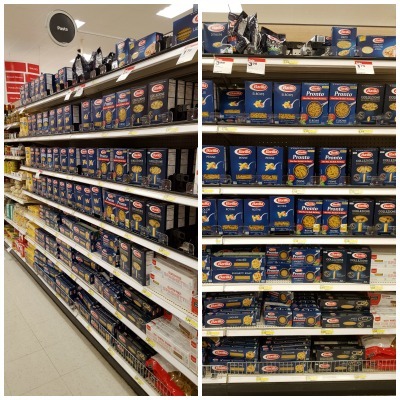 When I was shopping at Target last week, I came across Barilla® pasta. It provides the balanced nutrition that families need to live a healthier and delicious lifestyle. And with a variety of pastas to choose from, there’s a kind for everyone. 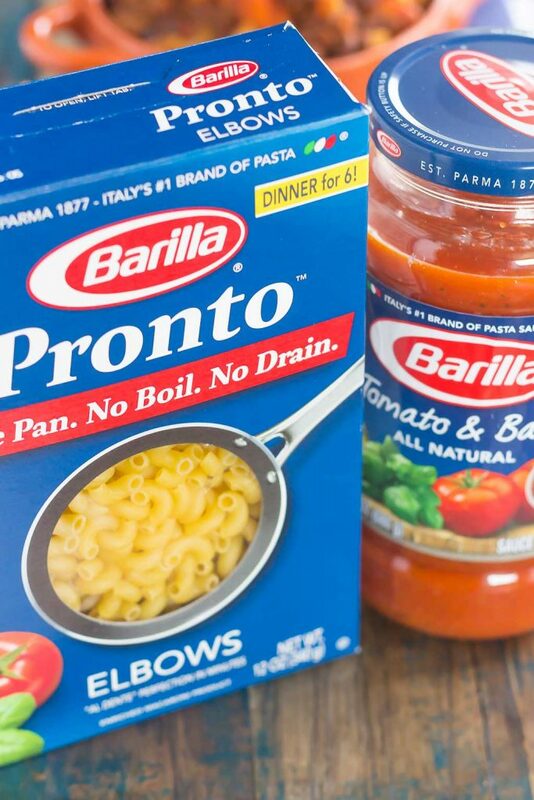 My go-to pasta of choice is Barilla® Pronto. It’s a one pan pasta that requires no boiling and no draining. Sounds pretty good, right? So, after stocking up on a box (or five) of Barilla® pasta and Barilla® Tomato Sauce, I headed home to put a spin on my chili recipe. And if one pot (and easy) meals are the name of your game, then you’ve come to the right place. I’m all about the simple dishes here on Pumpkin ‘N Spice, but when it comes to the holidays, you can be sure that easy recipes are happening all the time. That’s why this Sweet Potato Chili Pasta is a perfect, comfort dish for the season. 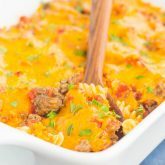 Filled with hearty ingredients, like sweet potatoes, ground beef, and Barilla® Pronto Pasta, this dish comes together in just one pot and can be ready in less than an hour. Flavorful, with just a hint of spice and filled with deliciousness, this chili pasta is just begging to made. And like most of my recipes, this Sweet Potato Chili Pasta is simple to make. After all, it’s a one pot dish that is sure to impress! You’ll start out by browning the ground beef and onions until the beef is no longer pink. After you drain, return to the pot and add in the sweet potatoes, diced green pepper, Barilla® Tomato Sauce, diced tomatoes, and the rest of the ingredients. Bring the mixture to a boil and then let simmer for about 20 minutes. Then, add in the Barilla® Pronto Pasta and return to a simmer until the pasta is fully incorporated. In less than 45 minutes, this Sweet Potato Chili Pasta is ready to be devoured. It’s perfect to serve on those busy weeknights, or for when you’re entertaining your holiday guests. So grab that Barilla® Pronto Pasta and the rest of the ingredients to whip up this easy, one pot comfort dish today! 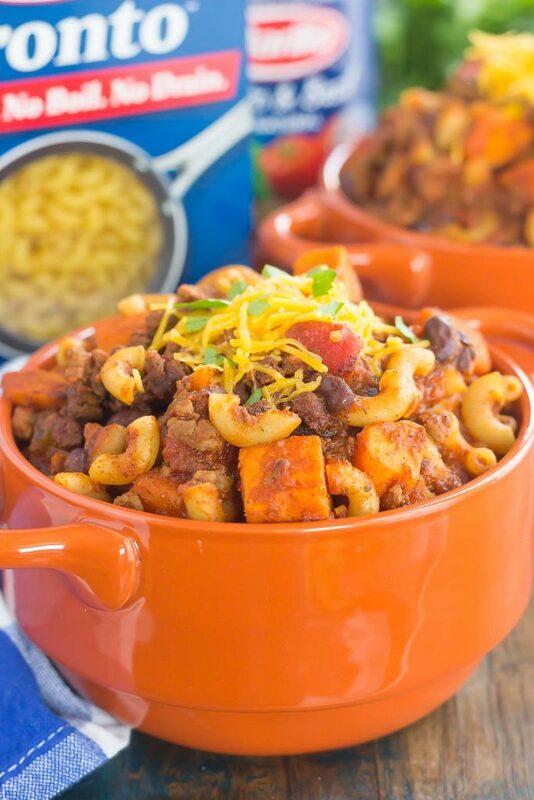 Subscribe to my YouTube Channel to see how easy this Sweet Potato Chili Pasta is to make! This Sweet Potato Chili Pasta is a one pot dish that's packed with the warm and comforting flavors of the season. 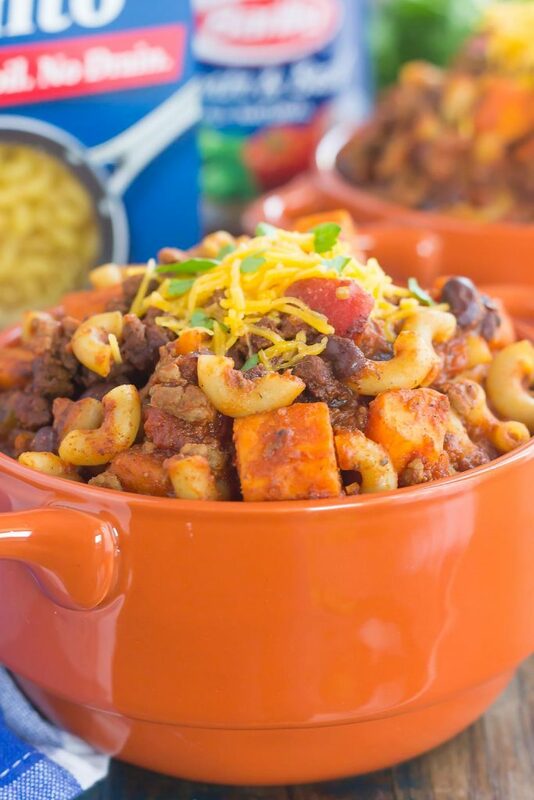 Hearty, thick, and filled with sweet potatoes, beef, black beans, and pasta, you'll love this easy meal! In a dutch oven or large pot, add ground beef. Cook until beef is no longer pink; drain and then return to pot. Add Barilla® Tomato Sauce, diced tomatoes, tomato paste, green pepper, garlic, cumin, chili powder, oregano, pepper, sugar, black beans, and sweet potatoes. Stir to combine. Bring mixture to a boil, then cover and simmer for about 20 minutes. Add Barilla® Pronto Pasta to mixture and stir to combine. Cook an addition 10 minutes over low heat. Serve immediately with sour cream or shredded cheddar cheese, if desired. Like what you see? Then be sure to head to your nearest Target to find your favorite Barilla® pastas and sauces. You can also head to this site for more information. Also, be sure to check out this Cartwheel Offer for 20% off Barilla® Pronto Pasta. But hurry! The offer expires on 11/26/2016. You can also find out more information about Barilla® by connecting with them on Facebook, Pinterest, Twitter, and Instagram. Thank you, Megan! This flavor combination is perfect! I haven't listened to Christmas music just yet, but I did watch my first Christmas movie of the season just yesterday....eek!! So exciting. I feel ya, though, on the same songs and movies playing over and over and over again. What's up with that, right? But, like you, I'll still watch over and over...how can I resist? This looks like a big bowl of comfort, Gayle. I love using sweet potato. They add so much flavour and are so good for ya. And Barilla pasta is definitely one of my faves. Pinned, of course. Hope you have a fantastic week! P.S. Can you believe it's the last full week of November?? Unreal how time flies. The night before Thanksgiving we tend to eat something that looks as different from our Thanksgiving meal as we can. This is precisely the kind of dish we make...it's usually taco soup... Thanks for offering up something new for us to try! Happy Thanksgiving, Gayle! Oh that's a great idea, Annie! You definitely don't want to repeat Thanksgiving two days in a row! :) Thanks for the kind words and happy Thanksgiving to you, too! Thanks, Ashley! Chili is definitely the perfect comfort food for cold weather! Chili is a perfect comfort food for these cold nights! I love the sweet potatoes in here! Definitely, Rachelle! Thanks for the kind words! OMG, I have noticed that both radio AND TV stations play the same few things on repeat. What ever happened to variety, right? I thought it was supposed to be the spice of life! ;) Anyways, I'm super excited about the holidays (mostly because Boy will finally take his vacation days.. he's a work-aholic), but also for all the food! I am obsessing over this chili pasta, Gayle!! This looks suuuuuper comforting and hearty! I could totally curl up with a BIG OLE BOWL of this scrumptiousness!! LOVE it! Pinned of course! Cheers! Haha yes! Variety should be the spice of life! :) And yay for your husband taking his vacation days from work...that's EXACTLY how my husband is too. He never takes them! Thanks for the sweet comment and pin, Cheyanne! I never really get into Christmas music because the repetitiveness totally bugs me! But I'm looooving this big bowl of pasta - sweet potatoes were an amazing addition! I'm much more in the Christmas spirit this year than I was last year already...I haven't turned on Christmas music yet though! Maybe after Thanksgiving. 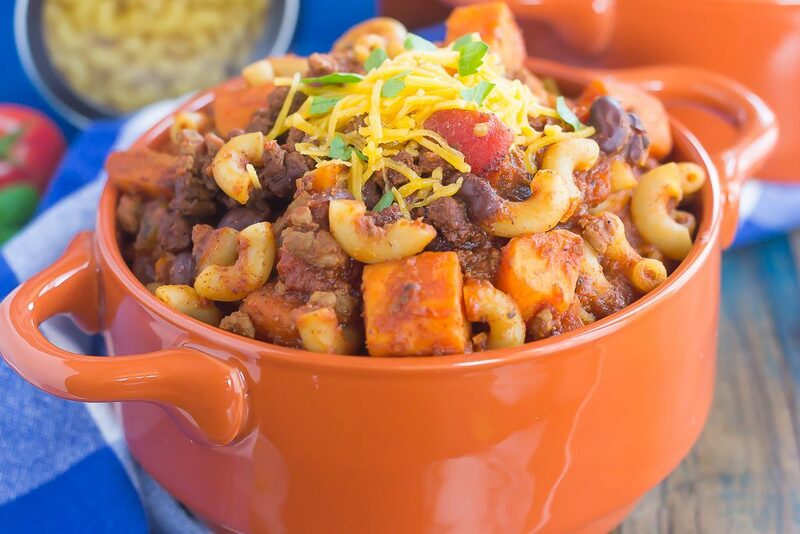 :) I love that you combined chili and pasta to make one really hearty dish, and the addition of sweet potato is always a good thing in my book. This looks delicious! Thanks, Marcie! I'm loving the sweet potatoes in here, too! This sounds so easy and so comforting! Perfect for the season, Gayle! It is the most wonderful feeling! I love this time of year! :) Thanks for the sweet comment, friend! I hope you have a wonderful Thanksgiving, too! that's so comforting! I would take a bowl please! We have our station on the Christmas music too and the kids are totally loving it! Easy dinners like this are a must these days with all the holiday craziness! Looks like the perfect bowl comfort food! Yay for Christmas music! Thanks for the kind words, Kelly! Our Christmas station is doing the same thing - or different versions of the same couple songs over and over again. Why?! But still, I listen, because Christmas music!! 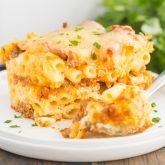 This pasta looks amazing Gayle, love quick and easy meals like this! Haha I still listen too, so I can't complain too much! :) Thanks for the kind words, friend! I have my Irish Christmas music radio on right now - now if only I had a bowl of this deliciousness to eat with it! Hooray for Christmas music! It just puts me in the best mood. Thanks for the kind words, Stephanie, and happy Thanksgiving! I totally agree about the same songs and movies being played over and over again! SO annoying for those of use that want to listen/watch all season long! There is definitely nothing better than a warm bowl of chili on a cold night - you definitely have me craving some right now. Gotta try it asap! Have a great Thanksgiving, Gayle!! Thanks so much, Keri! I hope you have a wonderful Thanksgiving, too! 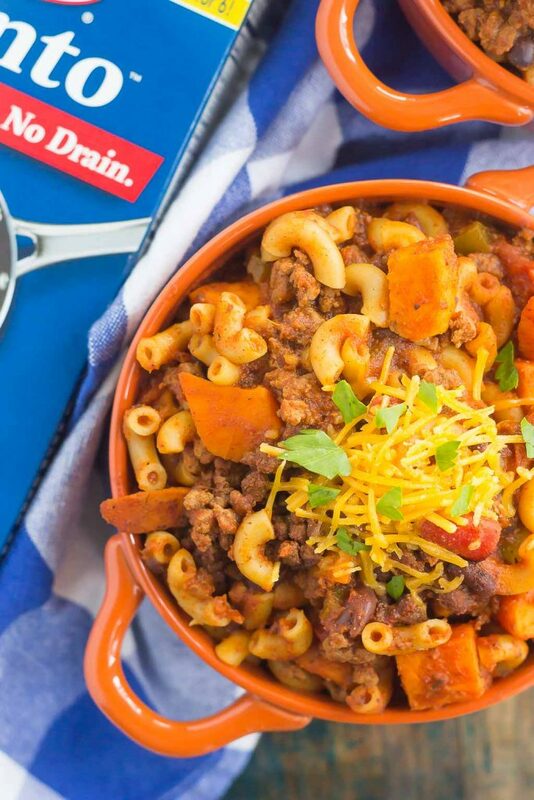 I absolutely LOVE that you've added sweet potatoes to this chili pasta, Gayle! I seriously can't get enough of them this time of year. This one pot meal would definitely be a hit in my house. I love how cooking everything in one pot ensures that the pasta soaks up so much good flavor! Thanks for the kind words, Cathleen! This chili is one of my favorites for the winter! Hi, Sounds yummy! Can this be made in the slow cooker? If so, what adaptations would I have to make? Hi Alison! I've never made this in the slow cooker, so I'm not sure how it would turn out. I would brown the ground beef before adding to the slow cooker and then add the noodles during the last 10 minutes or so to finish cooking. I would cook this on low for 7-8 hours or on high for 3-4 hours, or until the sweet potatoes are tender and everything is mixed together. This would be my recommendation, hope it turns out well! Thanks for the suggestions. I'm going to give it a try! You're very welcome! Hope you enjoy this and thanks for stopping by!